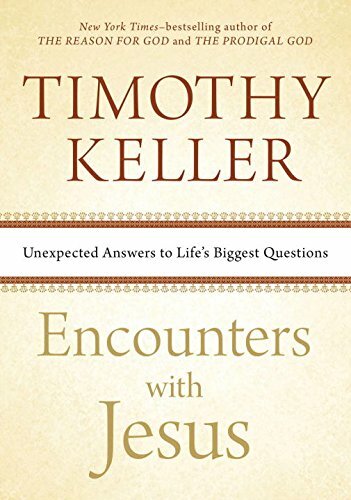 In Encounters, Dr. Timothy Keller explores 10 encounters with Jesus: 5 encounters that Jesus had with non-Christians in the Gospel of John (e.g., Nicodemus and the woman at the well), and 5 encounters with aspects of who Jesus was and what he has done (e.g., his obedience and his ascension). In doing so, we, as readers, are forced into these same encounters—not, however, as mere spectators, but as those that must make a decision about Jesus: neutrality is not a legitimate option. “Jesus demands a radical response of some kind” (46). And in our response to Jesus, we encounter “Life’s Biggest Questions” (a fitting subtitle). A strength of the book, as with all of Keller’s material, is the balance between accessibility and profundity—which, incidentally, in my opinion, has a deep resonance with Jesus himself—accessible, yet profound, at least for those that risk the encounter. At our church, we recently used this book in a class, particularly the first five chapters, to leverage just these kinds of encounters—encounters with Jesus and encounters with the big questions of life—but also with one additional aim: to learn how the Master (that’s Jesus, not Keller) interacted with non-Christians. We emphasized how Jesus witnessed to others and how we might in turn then display Jesus to others. In this regard, Keller was, we might also say, a masterful example of engagement.